It is best to think of culture as a repertoire, like that of an actor, a musician, or a dancer…We can ask not only what pieces are in the repertoire but why some are performed at one time, some at another. Karyn Lacy is an Associate Professor of Sociology and African American Studies at the University of Michigan. At the time of her MIT appointment, she was a PhD candidate in sociology at Harvard. Research interests: urbanization, sociology, African American studies, race and ethnicity, the black middle-class. Professor Lacy earned a BA in Urban Studies and Black Studies (1987) from Oberlin College. She holds MA degrees in African-American Studies (1991) and Sociology (1993) from Temple University, and the PhD in Sociology (2000) from Harvard University (dissertation topic: "The Suburbanization of Middle-Class Blacks"). In 2004, Prof. Lacy arrived to the University of Michigan as an assistant professor in the Department of Sociology and the Center for Afro-American and African Studies. Her prior teaching appointment was at Emory University in Atlanta, where she served multiple roles as assistant professor in the Department of Sociology and as associated faculty in African American Studies, as well as core faculty member in the Sloan Center for Myth and Ritual in American Life. Prof. Lacy is the author of Blue-Chip Black: Race, Class, and Status in the New Black Middle Class. 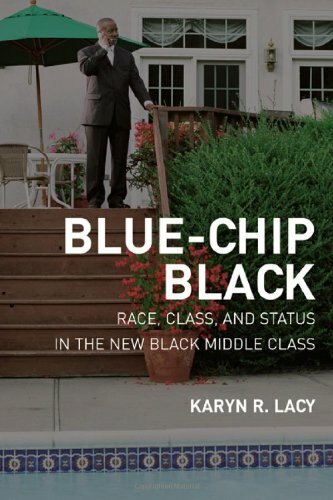 Based on her work in the suburbs of Washington, DC, the book explores the identity of what Prof. Lacy terms "blue-chip black" suburbanites: middle-class blacks who live in middle-class suburbs where poor blacks are not present. Prof. Lacy is a member of the American Sociological Association, the Association of Black Sociologists, the Eastern Sociological Society, the Southern Sociological Association, and the Society for the Study of Social Problems. She has been a Ford Fellow and was a Visiting Scholar at the Russell Sage Foundation. As an MLK Visiting Professor at MIT, Prof. Lacy was hosted by the Department of Urban Studies and Planning (DUSP), where she taught a course on suburban America. “Schooling and Subaltern Groups,” Emerging Trends in the Social and Behavioral Sciences, Fall 2013. “Is Voluntary Segregation Voluntary?” forthcoming in the volume Race and Real Estate, edited by Kim Lane Scheppele and Valerie Smith. “All’s Fair? : The Foreclosure Crisis and Middle-Class Black (In)Stability,” 2012 American Behavioral Scientist 56: 1565-80. “Black Middle Class,” The New Encyclopedia of Southern Culture, 2010. Lacy, Karyn and Angel Harris. 2008. “Breaking the Class Monolith: Understanding Class Differences in Black Adolescents’ Attachment to Racial Identity.” In Dalton Conley and Annette Lareau (eds) Social Class: How Does It Work. NY: Russell Sage Foundation. Blue-Chip Black: Race, Class, and Status in the New Black Middle-Class. Berkeley, CA: University of California Press. June 2007. “Black Spaces, Black Places: Strategic Assimilation and Identity Construction in Middle-class Suburbia.” Ethnic and Racial Studies, 2004. Reprinted (2006) in Patricia and Peter Adler (eds) Sociological Odyssey: Contemporary Readings in Introductory Sociology. NY: Wadsworth Publishing. ​“‘A Part of the Neighborhood?’: Managing Black-White Boundaries in American Suburbs.” International Journal of Sociology and Public Policy 22:39-70, 2002.